Our brand voice, the language that we use when posting on social media, directly affects how our business is perceived. Platforms like Facebook, Instagram and Twitter are fantastic free business tools. They allow us to promote what we do, share relevant information and engage with customers quickly and effectively, on a more personal level than ever before. When we get social media interaction right, the results can be instant and astounding. But used badly, social media may spell disaster for a company’s reputation and future prospects. So how strong is your brand voice and why does it matter? A well-developed brand voice can do so many things for your business. Allow you to streamline your responses and reactions. Helps to make your business recognisable and identifiable. Helps to build trust and loyalty by delivering a consistent message. Allows your target audience to relate more easily to your brand. Allows you to stay in control and shape opinion. Helps you to develop a style and personality that’s exclusively yours. Helps you to cut out jargon and sale speak, authentically engaging with customers and building relationships that last. Provides reassurance to customers but letting them know what they can expect from an interaction with your brand. Builds a community around your brand. How we talk about our brand on social media matters. We spend endless time and money developing a fantastic logo or great looking website for our brand, because we understand the value of a marketing resource that’s instantly recognizable and allows potential customers to instantly understand the values we represent. A brand voice does the same thing. We understand this and are much more likely to consider brand voice when writing online or printed content, but we often overlook it when posting on social media. Perhaps print and online content feel more permanent in comparison to the fast-paced environment of sites like Twitter and Instagram, where content turns over at break-neck speed. And creating a social media post is so quick and simple that we often dash off these interactions when we have only a few seconds to spare, or while we’re on the go, juggling other tasks. 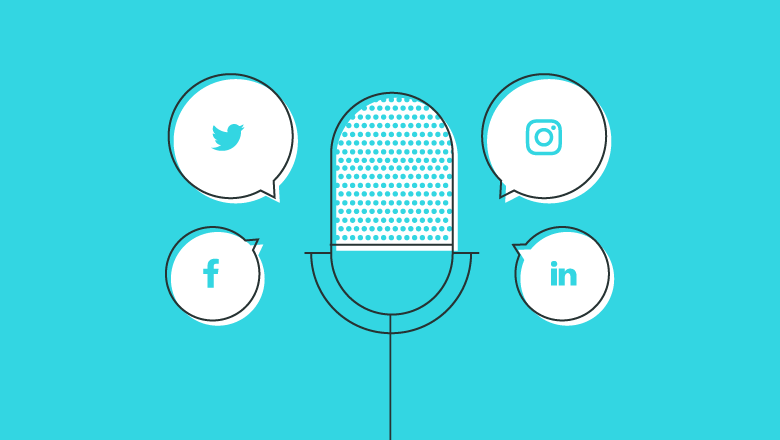 When used via social media, a strong and consistently applied brand voice will build enduring relationships with existing followers along with attracting a new audience. If people can identify with and relate to your brand voice, they’ll begin to feel loyalty towards your company and will enjoy the comfort of knowing what to expect when they interact with you. An inconsistent voice is unpredictable and disruptive. A consistent voice is calm, clear and reassuring. If you’re sold on the importance of a strong, unique brand voice, how do you go about developing yours? And how can you apply it to social media once you do? Developing a brand voice isn’t as difficult as it sounds. All you have to do is find it, shape it and use it every day until it becomes second nature. making a list of the qualities you believe your brand possesses, the values that shape your business decisions. Once you have a list of values, you can match your tone of voice to these and begin developing how to address your customer. A quirky brand might use language that is humorous, current, remarkable, surprising, even a little shocking. A quirky brand would avoid using language that’s too serious, business like, filled with jargon, formal or detached. A professional brand might use language that’s formal, serious, business like and straightforward. Knowing the tone you want to use in order to convey your message will allow you to select language that positively represents the values of your company and gets to the heart of what make you special. You can even make a list of words that you want to use more and words you want to use less or avoid altogether, inserting these into your content until it becomes natural to do so without thinking. Decide how you’ll use your voice. Do we use jargon or slang? Do we speak frankly or take a diplomatic stance? Do we wade into debates or stay out of heated conversation? Even down to the use of emoticons or whether you address customers by name when replying to comment, the more thought you can give to consistency, the more trust and credibility you will build with your following. For many businesses, it’s necessary for a range of users to keep on top of social media updates. If posts don’t come from once source, everyone involved in providing content needs to be familiar with your brand voice and how to use it. Remember, your brand voice isn’t your own voice. When posting on behalf of your business, you should be using a different voice than the one you’d use in personal updates. Every word that you share reflects your business and alters the way in which your audience views it. A casual comment or joke that might be acceptable for your personal account may cause irreparable damage to your business following. Adopting your brand voice while business posting will go a long way to protecting your company’s image and reputation from minor slip ups that could become major headaches. Keep using your brand voice. At first, it might feel awkward or strange to start using this new voice on social media. Stick with it, as the more you use your brand voice, the stronger and more consistent it will become. Writing down some guidelines to refer to when posting is useful, as is reading each post aloud before it goes live. Ask yourself, is this brand trustworthy? Would I do business with these guys? What am I learning about the brand from the language used and is this a positive and accurate reflection of what we do? It will soon become second nature to use your brand voice for all social media interaction, all it takes is practice and commitment. Make a list of words and phrases you want to avoid. How many of us instantly feel angry, for example, when a company tells us; ‘We really value your custom.’ After we make a complaint? Alongside developing your brand voice for social media, you may want to think about standardising the fonts, colours and images you use. All of these elements combined work together to build a picture of your brand.